If Lu Meng does not use any Attack cards during his turn, he can skip his discard phase. Lu Meng cannot use a single Attack during his turn to activate "Self-Restraint." This includes both him attacking other player and using Attacks in a Duel. There is no ceiling that Lu Meng will hit if he keeps holding his card. Theoretically, he could eventually hold the whole deck. However, the game ends in a draw if there are no card to draw when a player needs to draw. Lu Meng has the wonderful option of just holding on to everything that he does not need to use. If Lu Meng gets left alone for a long period of time, he can really collect a lot of cards and if he gets the right ones, he can punish a lot of people when he strikes. For this reason, he is excellent with the Crossbow. He can store cards until he gets the Crossbow then unleash every Attack that he has to kill his enemies. Lu Meng is not as effected by Capture as other characters are. If he is successfully targeted by captured, he can simply draw two cards in his drawing phase and hold all of his cards when bypassing his discard phase. If Lu Meng does not play Attack cards during his turn, it is difficult for him to contribute to his team. Even if Lu Meng does not do anything, the other characters can determine the roles of everyone else and determine Lu Meng's role with the process of elimination. If his enemies see that he is stockpiling a lot of cards, they will likely try to do something about it. Wu Gou Tia - Wu Gou Tia can force someone to exchange their equipment with Lu Meng. This can benefit him if he gets the Crossbow. Zhang Zhao & Zhang Hong - Zhang Zhao & Zhang Hong can give Lu Meng one of his cards discarded in the discard phase back if he Attacks with a great excess of cards and take the rest into their hand. This is a powerful strategy if they are on the same team and Zhang Zhao and Zhang Hong can use the cards that Lu Meng stored. Sun Jian - Sun Jian can be a friend or foe. 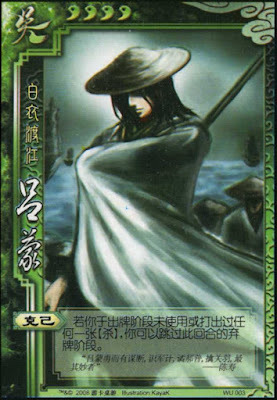 He can either have Lu Meng draw more cards than he discards, or discard more cards that he draws during the use of "Brave Spirit." 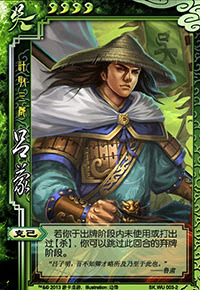 Zhang He/Zhang Liao/Gan Ning - These characters can easily decrease the number of hand cards that Lu Meng has. Sima Yi - Each time Lu Meng hurts Sima, Sima can remove one of his cards. This ruin's Lu Meng's Crossbow strategy, as Sima Yi will take the Crossbow on the first hit. Lu Bu - Lu Bu's "Matchless" makes it difficult for Lu Meng to respond to his Attacks and Duels. Lu Meng is one of the few characters who could respond to Lu Bu, but each instance will require him to lose two cards to prevent the damage. This is very taxing, as Lu Meng only draws two cards on each of his turns. Ma Chao/Huang Zhong - Ma Chao's "Iron Cavalry" give his Attacks a 50% chance of being inescapable, bypassing all of the stored Escapes and doing damage anyway. Huang Zhong's Attacks are going to be Inescapable if Lu Meng has more hand cards than Huang Zhong has units of health, which will be most of the time if Lu Meng uses his power. Ma Su - If Lu Meng kills Ma Su, he will lose all of his cards. This could really put a damper on Lu Meng's strategy if he wants to kill multiple opponents with the Crossbow on a single turn. King One would think that Lu Meng would be a good king because he can hold many cards at the end of his turn. This usually does not turn out to be the case. When Lu Meng is the focus of many rebels, his card advantage is severely crippled. If there are only a couple of rebels, he might have a better chance of winning as king. Lu Meng is a mediocre loyalist. He can stockpile Peaches, but his ability forces him to remove himself from the game and not help the king kill rebels. Rebel Lu Meng is a mediocre rebel when he has many teammates. He can store Peaches and hold out for a Crossbow to unleash on the king. However, the fact that he cannot directly contribute to the team's goal of killing the king. Spy Lu Meng is a mediocre spy. While he can last a long time and keep the king alive, he has trouble influencing the battle without Attacking. Lu Meng's power is great, but he is unfortunately flawed in team situations. He cannot have an active role in the game if he is storing cards. However, Lu Meng is excellent in one-on-one situations. Remember, he is better when fewer characters are playing. If he is only fighting one person, he will 'grow' very quickly and he quickly becomes an attractive character to use.